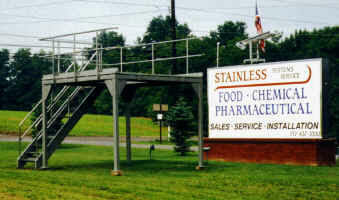 Manufactures and Designs Sanitary Stainless Steel Conveyors, Metal Detection Systems, Rotary Tables, Hydraulic Dumpers, Scale and Equipment Platforms, Hand Railings, Processing Systems and Complete System Design Integrations including Electrical Panels, Process Systems, and Custom Equipment Manufactured for Food, Pharmaceutical and Other Industries. Stainless System Service manufactures products from Stainless Steel, Aluminum, Carbon, Hastalloy and other materials. Stainless System Service designs, manufactures, and installs stainless steel sanitary processing equipment and machines. Parts manufacturing for other companies as well. Please look around to see our services and the products that we supply. Copyright © 1980-2010 Stainless System Service. All Rights Reserved.